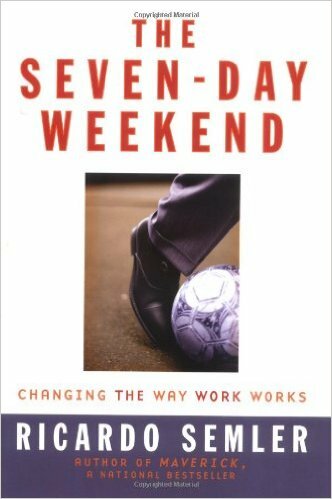 This great book by Ricardo Semler is something that some of my friends have been recommending me to read for years. I have constantly have heard that I would find enough reflections of my thoughts and my character in it, but somehow I have always managed to delay getting my hands on this little book, giving priority to other materials. Until 1 week ago. And judging by the easiness of my reading of this book, it is extremely accessible for everyone, no matter what your professional roots or interests are. I have practiced some of the suggestion of this book for a number of years, and I know enough friends who do this as well, but the organisation on the enterprise level would be really helpful for so many people. This book is not only on the leadership & management, but it is definitely focused on the whole topic of education & social entrepreneurship. Revolutionary – is the best way I can describe it. I am definitely surprised by the deepness of some of the thoughts and the will to risk and try out new stuff. This is how you define a modern entrepreneurship. Not like putting a title on LinkedIn and then bashing everyone around, but by listening, trying and building. The whole thought that Semco Partners (Ricardo Semler’s company) has been practicing & innovating all this years is really refreshing and really explains me some of the practices that some of the companies (that I do admire) have adopted. Also, there are some laws in different countries, that under certain circumstances actually make companies to follow similar practices that Semco has implemented. I loved some of the paragraphs & references to the practices of firing the bottom (would love to know, how is it decided on which criteria) 10% of the company, I wholeheartedly do not understand whole 20-60-20 (%) crap (best-medium-low), which is based on the normal distribution, but has nothing to do with human behaviour, because no single number can describe any person. Another important point was the economical growth of the firms. I have always been an admirer of the smaller ventures that just simply do great work and not embracing the corporation or franchising ways, that do not bring or spread any of the unique culture inside the firm. – Leave the control to the professionals, if you are a manager and hired/decided who will be on your team, then you surely hired people who know more than you about the daily process. They should be much more able to optimize it. – Modern times require flexibility, and it should definitely start on the working place. If you ever aspire to manage other people, please read this book. If you want to see how far you can stretch your faith in other people, consider reading this book.